The Second College Grant has worked with partners to design and implement a silvicultural study for climate change adaptation in New Hampshire. The Dartmouth College Second College Grant is participating in a nation-wide study called Adaptive Silviculture for Climate Change (ASCC). The goals of this project are to test different silvicultural approaches to climate change adaptation that will also serve as useful examples across the country. The Second College Grant is one of the five ASCC study sites. “The Grant” consists of 27,000 acres of forests, rivers, and wetlands in the Northern Forest region of New Hampshire, and has been owned and managed by Dartmouth College since 1797. The forest is predominantly rich, mesic northern hardwoods dominated by sugar maple, American beech and yellow birch with minor components of red maple, red spruce, and other species. 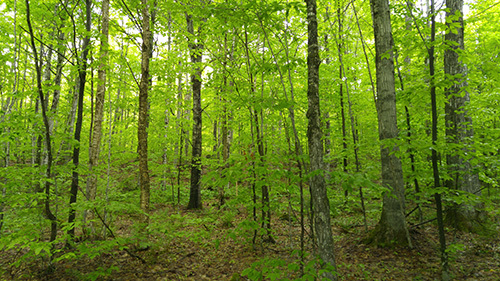 “The Grant” has long been utilized for timber, but is also recognized as a model forest used for wilderness recreation and forest and natural resource research. Learn more about the Second College Grant here. Tony D’Amato (University of Vermont and Northeast Climate Science Center) is the site lead for the Second College Grant ASCC project and key partners include Dartmouth College (Matt Ayres, Kevin Evans, Rich Howarth, Dave Lutz, Fiona Jevon, Liz Studer), USDA Forest Service Northern Research Station (Chris Woodall, Dave King, Brian Palik), and University of Maine (Shawn Fraver). Graduate students involved in the project include Peter Clark (UVM), Fiona Jevon (Dartmouth), Jen Santoro (UVM), and Liz Studer (Dartmouth).